24MX Leader Plates: HAAKER Holds On, HOARE Already Champion ! With each passing round so far the 24MX Leader Plate has moved from Taddy BLAZUSIAK (PL – KTM) to Cody WEBB (USA – KTM) to Colton HAAKER (USA – Husqvarna). 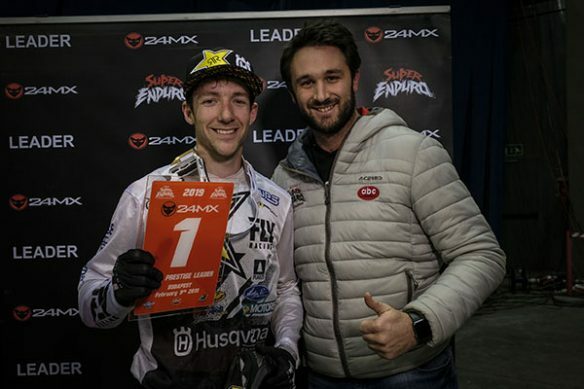 But despite BLAZUSIAK taking overall victory in Budapest, HAAKER holds on and is now 12 points ahead of his compatriot WEBB and 27 ahead of six-time World Champion, BLAZUSIAK. It’s all to play for at the grand finale in Bilbao between these three stars! In Junior, William HOARE finished the job by taking the World Title one whole Grand Prix before the end of the season! 24MX Leader since the very first Grand Prix, the Brit didn’t cave under pressure and put together an impeccable treble win while his main rivals Tim APOLLE (D – KTM) and David CYPRIAN (CZ – KTM) struggled against the tide of young hopefuls in the class. HOARE joins Giacomo REDONDI (I) in the ‘Hall of Fame’ of riders who have won the title a round before the end of the season. Who from HAAKER, WEBB and BLAZUSIAK will win the ultimate prize? Vorig berichtVorige The Tremendous Triplet, HAAKER, WEBB & BLAZUSIAK fight it out until the last second ! Volgend BerichtVolgende WEBB On Another Level !